Prepare shrimp according to package directions. In a large bowl, combine coleslaw mix and Boom Boom sauce. Warm taco shells by wrapping them in a damp paper towel and microwaving on high for 30 seconds. 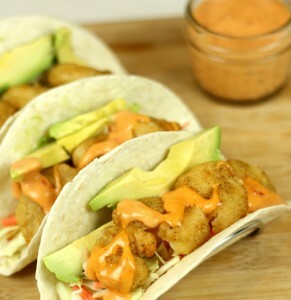 Place 1/4 cup of coleslaw mixture on each taco shell. Drizzle remaining Boom Boom Sauce on top of shrimp.